A true classic! 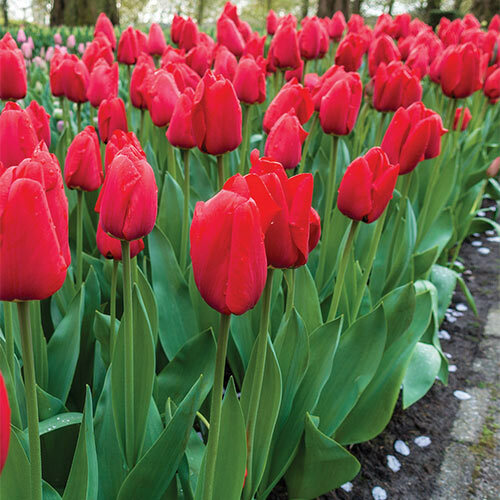 Lalibela is a bright red Darwin Hybrid-type tulip that bestows its brilliant color and traditional egg-shaped form wherever it's planted in the landscape. Suggest to customers that they plant in full to part sun and well-drained soil, though Lalibela is tolerant of many different soil types. This is an ideal variety for large perennialized areas, as well as mixed borders, seasonal cutting gardens and floral arrangements. The blooms are quite large and sit proudly upon strong 22" stems. One of the favorites of landscapers because of its perennializing habit, tall stems and large, vibrant flowers. Though it was introduced less than 20 years ago, we predict this beauty will become a popular favorite.